The Western media in chorus have described the unfolding conflict in Iraq as a “civil war” opposing the Islamic State of Iraq and al-Sham against the Armed forces of the Al-Maliki government. The conflict is casually described as “sectarian warfare” between Radical Sunni and Shia without addressing “who is behind the various factions”. What is at stake is a carefully staged US military-intelligence agenda. Known and documented, Al Qaeda affiliated entities have been used by US-NATO in numerous conflicts as “intelligence assets” since the heyday of the Soviet-Afghan war. In Syria, the Al Nusrah and ISIS rebels are the foot-soldiers of the Western military alliance, which oversees and controls the recruitment and training of paramilitary forces. The Al Qaeda affiliated Islamic State of Iraq (ISI) re-emerged in April 2013 with a different name and acronym, commonly referred to as the Islamic State of Iraq and Syria (ISIS). The formation of a terrorist entity encompassing both Iraq and Syria was part of a US intelligence agenda. It responded to geopolitical objectives. It also coincided with the advances of Syrian government forces against the US sponsored insurgency in Syria and the failures of both the Free Syrian Army (FSA) and its various “opposition” terror brigades. The decision was taken by Washington to channel its support (covertly) in favor of a terrorist entity which operates in both Syria and Iraq and which has logistical bases in both countries. The Islamic State of Iraq and al-Sham’s Sunni caliphate project coincides with a longstanding US agenda to carve up both Iraq and Syria into three separate territories: A Sunni Islamist Caliphate, an Arab Shia Republic, and a Republic of Kurdistan. Whereas the (US proxy) government in Baghdad purchases advanced weapons systems from the US including F16 fighter jets from Lockheed Martin, the Islamic State of Iraq and al-Sham –which is fighting Iraqi government forces– is supported covertly by Western intelligence. The objective is to engineer a civil war in Iraq, in which both sides are controlled indirectly by US-NATO. The scenario is to arm and equip them, on both sides, finance them with advanced weapons systems and then “let them fight”. US-NATO is involved in the recruitment, training and financing of ISIS death squads operating in both Iraq and Syria. ISIS operates through indirect channels in liaison with Western intelligence. In turn, corroborated by reports on Syria’s insurgency, Western special forces and mercenaries integrate the ranks of ISIS. While the media acknowledges that the government of Prime Minister Nuri al-Maliki has accused Saudi Arabia and Qatar of supporting ISIS, it invariably fails to mention that both Doha and Riyadh are acting on behalf and in close liaison with Washington. Under the banner of a civil war, an undercover war of aggression is being fought which essentially contributes to further destroying an entire country, its institutions, its economy. The undercover operation is part of an intelligence agenda, an engineered process which consists in transforming Iraq into an open territory. Meanwhile, public opinion is led to believe that what is at stake is confrontation between Shia and Sunni. America’s military occupation of Iraq has been replaced by non-conventional forms of warfare. Realities are blurred. In a bitter irony, the aggressor nation is portrayed as coming to the rescue of a “sovereign Iraq”. An internal “civil war” between Shia and Sunni is fomented by US-NATO support to both the Al-Maliki government as well as to the Sunni ISIS rebels. The “War on Terrorism” consists in creating Al Qaeda terrorist entities as part of an intelligence operation, as well as also coming to the rescue of governments which are the target of the terrorist insurgency. This process is carried out under the banner of counter-terrorism. It creates the pretext to intervene. ISIS is a caliphate project of creating a Sunni Islamist state. It is not a project of the Sunni population of Iraq which is broadly committed to secular forms of government. The caliphate project is part of a US intelligence agenda. In response to the advance of the ISIS rebels, Washington is envisaging the use of aerial bombings as well as drone attacks in support of the Baghdad government as part of a counter-terrorism operation. It is all for a good cause: to fight the terrorists, without of course acknowledging that these terrorists are the “foot soldiers” of the Western military alliance. Needless to say, these developments contribute not only to destabilizing Iraq, but also to weakening the Iraqi resistance movement, which is one of the major objectives of US-NATO. The Islamic caliphate is supported covertly by the CIA in liaison with Saudi Arabia, Qatar and Turkish intelligence. 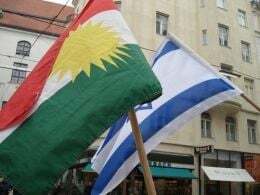 Israel is also involved in channeling support to both Al Qaeda rebels in Syria (out of the Golan Heights) as well to the Kurdish separatist movement in Syria and Iraq. More broadly, the “Global War on Terrorism” (GWOT) encompasses a consistent and diabolical logic: both sides –namely the terrorists and the government– are supported by the same military and intelligence actors, namely US-NATO. While this pattern describes the current situation in Iraq, the structure of “supporting both sides” with a view to engineering sectarian conflict has been implemented time and again in numerous countries. Insurgencies integrated by Al Qaeda operatives (and supported by Western intelligence) prevail in a large number of countries including Yemen, Libya, Nigeria, Somalia, Mali, the Central African Republic, Pakistan. The endgame is to destabilize sovereign nation states and to transform countries into open territories (on behalf of so-called foreign investors). The pretext to intervene on humanitarian grounds (e.g. in Mali, Nigeria or the Central African Republic) is predicated on the existence of terrorist forces. Yet these terrorist forces would not exist without covert US-NATO support. Something unusual occurred in Mosul which cannot be explained in strictly military terms. On June 10, the insurgent forces of the Islamic State of Iraq and the Levant (ISIS) allegedly (according to press reports) captured Mosul, Iraq’s second largest city, with a population of over one million people. While these developments were “unexpected” according to the Obama administration, they were known to the Pentagon and US intelligence, which were not only providing weapons, logistics and financial support to the ISIS rebels, they were also coordinating, behind the scenes, the ISIS attack on the city of Mosul. While ISIS is a well equipped and disciplined rebel army when compared to other Al Qaeda affiliated formations, “the capture” of Mosul, did not hinge upon ISIS’s military capabilities. Quite the opposite: Iraqi forces which outnumbered the rebels by far, equipped with advanced weapons systems could have easily repelled the ISIS rebels. There were 30,000 government forces in Mosul as opposed to 1000 ISIS rebels, according to reports. The Iraqi army chose not to intervene. The media reports explained without evidence that the decision of the Iraqi armed forces not to intervene was spontaneous characterized by mass defections. The report is misleading. The senior commanders were largely hardline Shiite. The defections occurred de facto when the command structure collapsed and senior (Shiite) military commanders left the city. What is important to understand, is that both sides, namely the regular Iraqi forces and the ISIS rebel army are supported by US-NATO. There were US military advisers and special forces including operatives from private security companies on location in Mosul working with Iraq’s regular armed forces. In turn, there are Western special forces or mercenaries within ISIS (acting on contract to the CIA or the Pentagon) who are in liaison with US-NATO (e.g. through satellite phones). Under these circumstances, with US intelligence amply involved, there would have been routine communication, coordination, logistics and exchange of intelligence between a US-NATO military and intelligence command center, US-NATO military advisers forces or private military contractors on the ground assigned to the Iraqi Army in Mosul and Western special forces attached to the ISIS brigades. These Western special forces operating covertly within the ISIS could have been dispatched by a private security company on contract to US-NATO. In this regard, the capture of Mosul appears to have been a carefully engineered operation, planned well in advance. With the exception of a few skirmishes, no fighting took place. Entire divisions of the Iraqi National Army –trained by the US military with advanced weapons systems at their disposal– could have easily repelled the ISIS rebels. Reports suggest that they were ordered by their commanders not to intervene. According to witnesses, “Not a single shot was fired”. The forces that had been in Mosul have fled — some of which abandoned their uniforms as well as their posts as the ISIS forces swarmed into the city. A contingent of one thousand ISIS rebels takes over a city of more than one million? Without prior knowledge that the US controlled Iraqi Army (30,000 strong) would not intervene, the Mosul operation would have fallen flat, the rebels would have been decimated. Had the senior Iraqi commanders been instructed by their Western military advisers to hand over the city to the ISIS terrorists? Were they co-opted? Was the handing over of Mosul to ISIS part of a US intelligence agenda? Were the Iraqi military commanders manipulated or paid off into allowing the city to fall into the hands of the ISIS rebels without “a single shot being fired”. Shiite General Mehdi Sabih al-Gharawi who was in charge of the Mosul Army divisions “had left the city”. Al Gharawi had worked hand in glove with the US military. 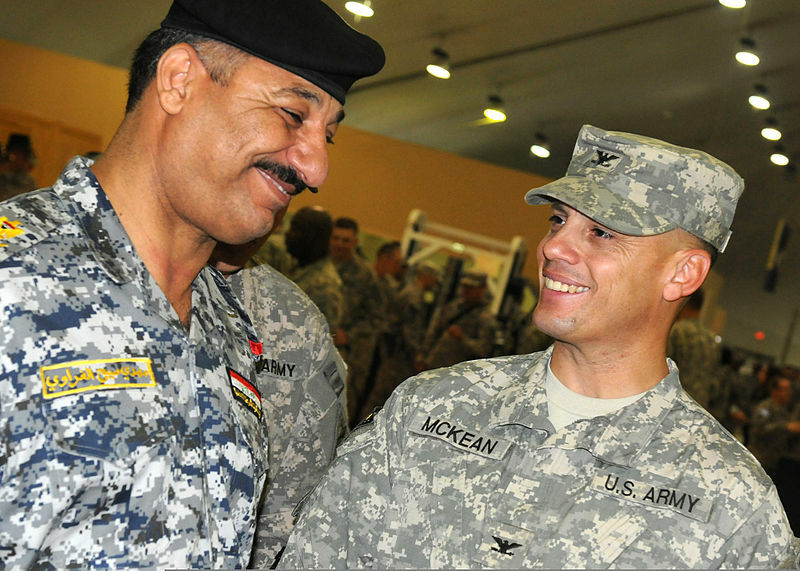 He took over the command of Mosul in September 2011, from US Col Scott McKean. Had he been co-opted, instructed by his US counterparts to abandon his command? US forces could have intervened. They had been instructed to let it happen. It was part of a carefully planned agenda to facilitate the advance of the ISIS rebel forces and the installation of the ISIS caliphate. The whole operation appears to have been carefully staged. In Mosul, government buildings, police stations, schools, hospitals, etc are formally now under the control of the Islamic State of Iraq and Syria (ISIS). In turn, ISIS has taken control of military hardware including helicopters and tanks which were abandoned by the Iraqi armed forces. Since the completion of this article, information has emerged on the central role played by the Sunni Tribes and sections of the former Baathist movement (including the military) in the “liberation” of Mosul and other cities. The control of Mosul is in the hands of several Sunni opposition groups. While these forces — which constitute an important component of the resistance movement directed against the al-Maliki government– are firmly opposed to ISIS, a de facto “relationship” has nonetheless emerged between the ISIS and the Sunni resistance movement. Sheikh Zaydan al Jabiri, leader of the political wing of the Tribal Revolutionary Council, told Sky News his organisation viewed ISIS as dangerous terrorists, and that it was capable of taking them on. “Even this blessed revolution that has taken place in Mosul, there may be jihadist movements involved in it, but the revolution represents all the Iraqi people – it has been brought about by the Sunni tribes, and some baathist elements, it certainly does not belong to ISIS,” he said. An exiled leader of the Iraqi resistance movement calling for “Western help” from the aggressor nation? From the above statement, one has the distinct impression that the Tribal Revolutionary Council has been co-opted and/or infiltrated. Moreover, in a bitter irony, within sectors of the Sunni resistance movement, US-NATO which supports both the Al Maliki government and the ISIS terrorists– is no longer considered the main aggressor nation. The Sunni resistance movement broadly considers Iran, which is providing military assistance to the al-Maliki government as well as special forces- as the aggressor alongside the US. In chorus The US media applauds: “The US and Iran have a mutual interest in stemming the advance of the Islamic State of Iraq and the Levant (ISIS)” (Christian Science Monitor, June 13 2014). An absurd proposition knowing that the ISIS is a creature of US intelligence, financed by the Western military alliance, with Western special forces in its ranks. Tehran is also using the ISIS pretext as an “opportunity” to intervene in Iraq: Iran’s intelligence is fully aware that ISIS is a terrorist proxy controlled by the CIA. There were no Al Qaeda rebels in Iraq prior to the 2003 invasion. Moreover, Al Qaeda was non-existent in Syria until the outset of the US-NATO-Israeli supported insurgency in March 2011. The ISIS is not an independent entity. It is a creation of US intelligence. It is a US intelligence asset, an instrument of non-conventional warfare. The ultimate objective of this ongoing US-NATO engineered conflict opposing the al-Maliki government forces to the ISIS insurgency is to destroy and destabilize Iraq as a Nation State. It is part of an intelligence operation, an engineered process of transforming countries into territories. The break up of Iraq along sectarian lines is a longstanding policy of the US and its allies. Through its covert support of the Islamic State of Iraq and al-Sham, Washington is overseeing the demise of own proxy regime in Baghdad. The issue, however, is not “regime change”, nor is the “replacement” of the al-Maliki regime contemplated. The division of Iraq along sectarian-ethnic lines has been on the drawing board of the Pentagon for more than 10 years. What is envisaged by Washington is the outright suppression of the Baghdad regime and the institutions of the central government, leading to a process of political fracturing and the elimination of Iraq as a country. This process of political fracturing in Iraq along sectarian lines will inevitably have an impact on Syria, where the US-NATO sponsored terrorists have in large part been defeated. Destabilization and political fragmentation in Syria is also contemplated: Washington’s intent is no longer to pursue the narrow objective of “regime change” in Damascus. What is contemplated is the break up of both Iraq and Syria along sectarian-ethnic lines. The formation of the caliphate may be the first step towards a broader conflict in the Middle East, bearing in mind that Iran is supportive of the al-Maliki government and the US ploy may indeed be to encourage the intervention of Iran. The proposed re-division of both Iraq and Syria is broadly modeled on that of the Federation of Yugoslavia which was split up into seven “independent states” (Serbia, Croatia, Bosnia-Herzegovina, Macedonia (FYRM), Slovenia, Montenegro, Kosovo). According to Mahdi Darius Nazemroaya, the re division of Iraq into three separate states is part of a broader process of redrawing the Map of the Middle East. The above map was prepared by Lieutenant-Colonel Ralph Peters. It was published in the Armed Forces Journal in June 2006, Peters is a retired colonel of the U.S. National War Academy. (Map Copyright Lieutenant-Colonel Ralph Peters 2006).